In this tutorial we will be discussing how to integrate Facebook Login into your android application. We will create a simple facebook login android application. LoginButton class – Which provides a button you can add to your UI. It follows the current access token and allows people to log in and out. LoginManager class – To initiate login without using a UI element. 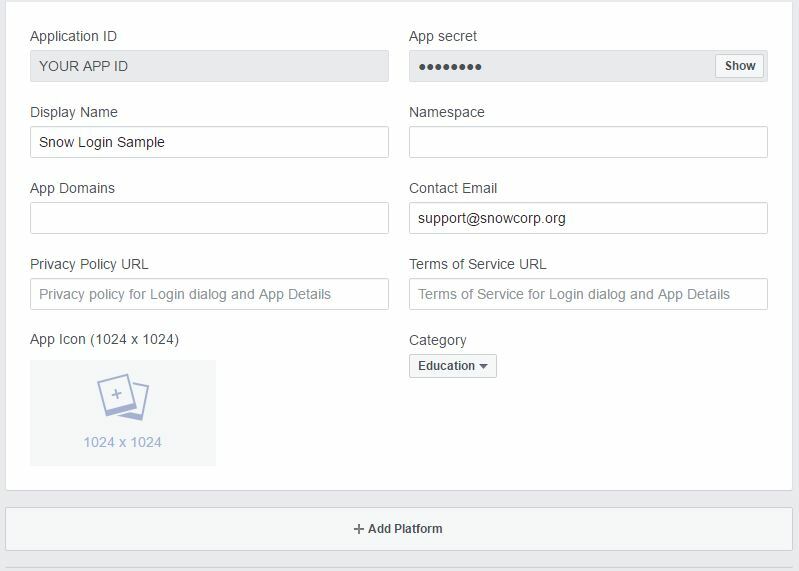 In this tutorial we will be using LoginButton Class to connect to Facebook. 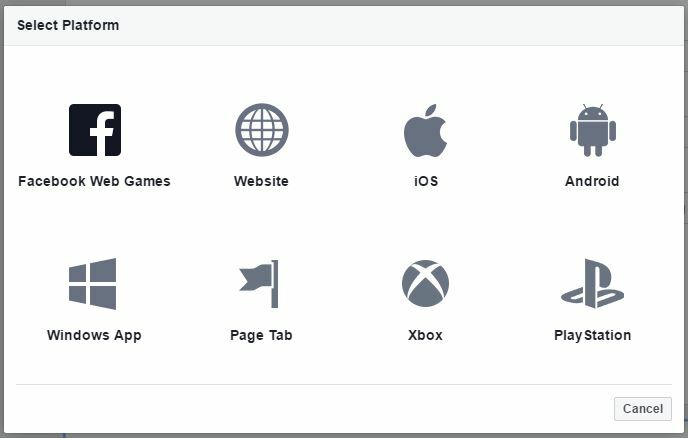 Facebook LoginButton element wraps functionality available in the LoginManager. So when someone clicks on the button, the login is initiated with the set permissions. The button follows the login state, and displays the correct text based on someone’s authentication state. Create a New Android Studio Project by going to File -> New -> New Project. Make sure you select Minimum SDK as API 15 : Android 4.0.3 (Ice Cream Sandwich) or higher. 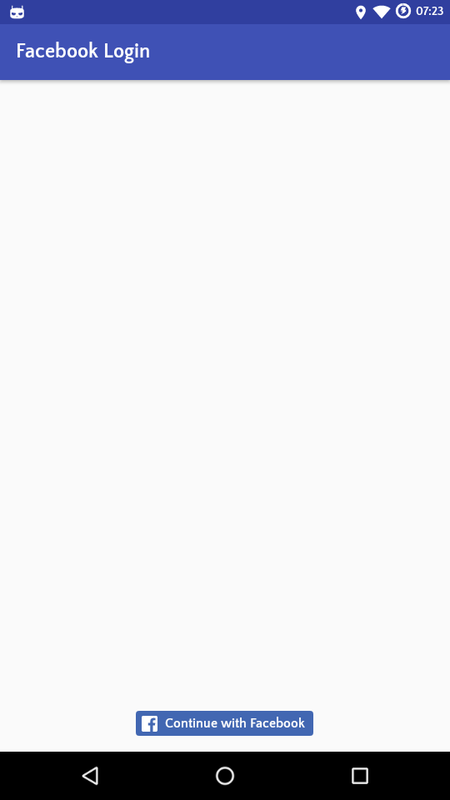 This is required for Facebook SDK to function correctly. Choose the activity type as Empty Activity and click next. Name the activity, We have used LoginActivity as the activity name. Make sure Generate Layout File check box is selected. This will create your project and initialize all the components. Build your project. Now you can import FacebookSdk into your app. Go to https://developers.facebook.com/. If you have not registered yourself as a developer yet then facebook will ask you to register as a developer. Simply register as a developer. Then click add a new app. Type you app name in Display Name and choose a category. Then click Create App Id button. You will see Product Setup screen, then from the left click on Settings menu. Click on add a platform and select android. Now enter your package name and class name of your main activity and click on save changes. You can find package name in your Android Manifest. To generate a key hash then add a temporary code to the onCreate() of MainActivity class. Copy the keyhash and enter that to your app settings in facebook and click save. 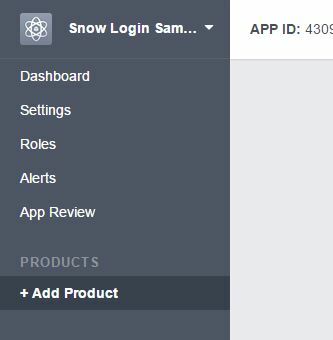 Add your Facebook app ID to your project and update your Android manifest. Open your strings.xml file. For example: /app/src/main/res/values/strings.xml. Enable Chrome Custom Tabs by adding an intent filter to your manifest and a fb_login_protocol_scheme to your strings.xml file. When you enable Chrome Custom Tabs, the SDK presents the login dialog in a Chrome Custom Tab instead of a WebView when the Facebook app is not installed. As a result, people do not have to enter their credentials again if they are already logged into Facebook in their Chrome browser. 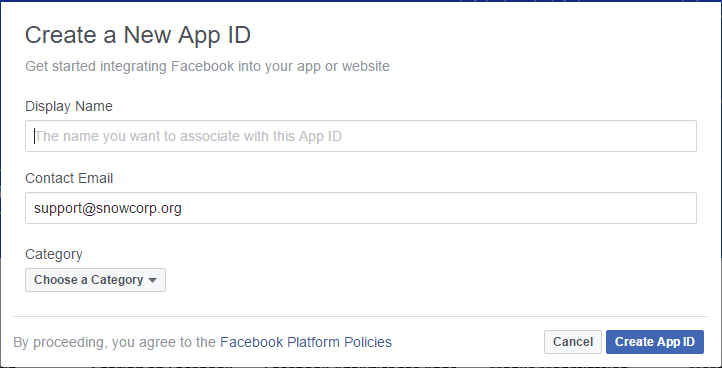 The simplest way to add Facebook Login to your app is to add LoginButton from the SDK. The LoginButton is a UI element that wraps functionality available in the LoginManager. When someone clicks on the button, the login is initiated with the permissions set in the LoginManager. The button follows the login state, and displays the correct text based on someone’s authentication state. Then set up the button in your UI by adding it to a fragment and update your activity to use your fragment. Finally, call callbackManager.onActivityResult to pass the login results to the LoginManager via callbackManager. Getting User data by Using the Graph API. The Graph API is the primary way to get data in and out of Facebook’s social graph. Add a ImageView in your layout for user’s profile picture. Go to your MainActivity.java and add the following code to onSuccess() method of registerCallback. sync your project and run your app. I follow each and every step of your tutorial, whenever i click the login button i am not getting FB Dialog saying “continue as “. 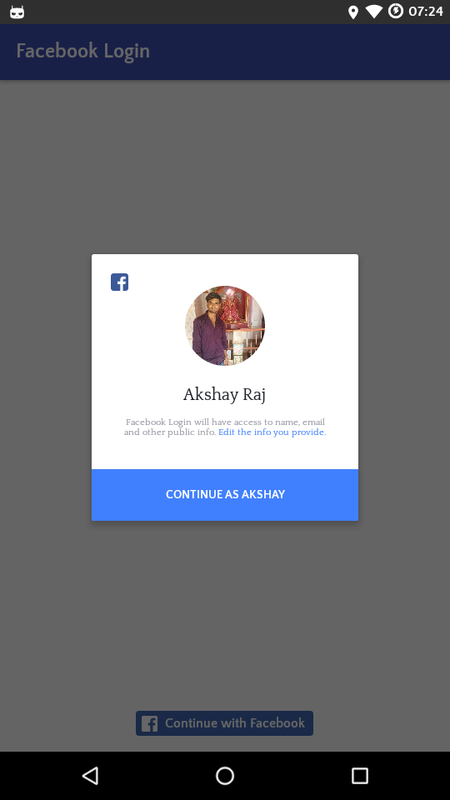 If you have facebook application then fb login work with fb app. I already have FB app in my phone. In my case, phone screen was completely occupied by the dialog, where as in your screenshot, it was displayed in middle(refer to your 2nd screenshot). Great ! Thanks so much.